SEATTLE, Sept. 27, 2018 /PRNewswire/ — Alaska Airlines announced today it will begin daily nonstop service between Seattle-Tacoma International Airport and El Paso International Airport, along with daily nonstop service between El Paso and San Diego International Airport. El Paso is a new destination for Alaska. 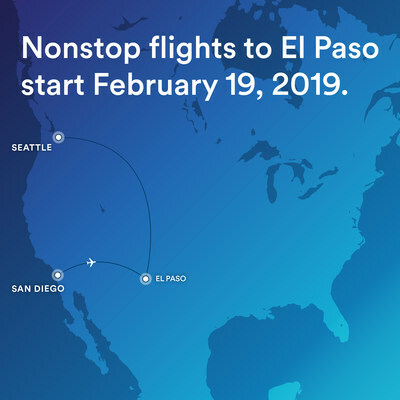 The new service is scheduled to begin Feb. 19, 2019, offering the only nonstop flights from Seattle and San Diego to El Paso. The nonstop flights that will connect Seattle and El Paso will help improve the travel time for employees who commute between Western Washington and West Texas – two regions with significant industry and business ties. Alaska has considered El Paso as a new destination for some time. It’s currently the largest underserved market from Seattle within the range of our Embraer 175 jets. That aircraft – with three cabin classes – is a perfect fit for this route, which will be flown by Horizon Air. Alaska Airlines’ guests can earn and redeem miles with Alaska’s highly-acclaimed Mileage Plan program, with award travel that starts at only 5,000 miles. With Alaska and its Global Partners, members can travel to more than 900 destinations around the world. Tickets for the new service go on sale today. To purchase, visit www.alaskaair.com or call 1-800-ALASKAAIR (800-252-7522 for Hearing & Speech Impaired (TTY): Dial 711 for Relay Services).